A hidden courtyard (with parking) leads to an unassuming historic building off Stellenbosch’s Dorp Street. 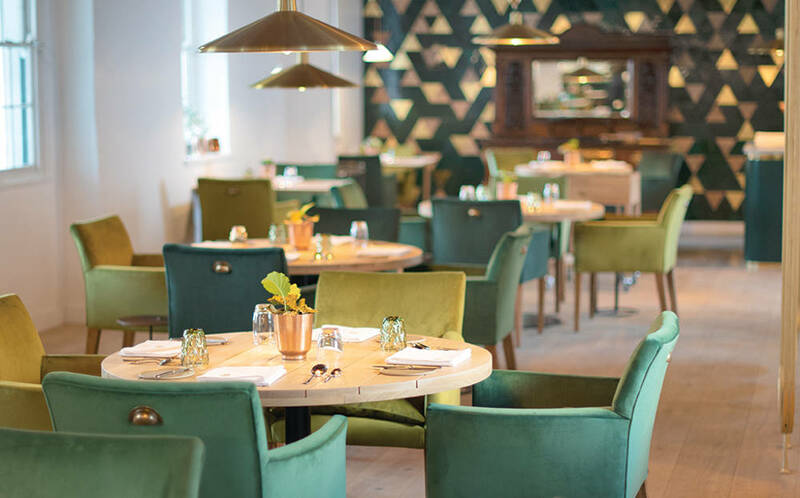 This is Eike, Bertus Basson’s sixth restaurant and brimming with excitement and creativity. “It’s all about being South African,” says chef Bertus. “We’ve got so many quirky, cheesy bits of being South African that we all understand.” He serves up a snapshot album of nostalgic food memories, culinary time-travel that is sometimes playful, sometimes down to earth, and always delicious. The multiple-course tasting menu (we lost count!) kicks off with the aperitif trolley. With a bloedlemoen gin and tonic to hand, we sample a series of canapes: a chakalaka, maize and morogo mouthful; a bite-size “bobotie” – springbok tartare with gentle bobotie spices; sweet potato; and curried custard. Bertus channels fancy 80s restaurants with an over-the-top prawn cocktail, his version a convincing argument for bringing that retro cliche back. A bit of cheesy fun next as a “jolly jammer” and milk is served, savoury Gruberg cheese biscuit, centred with tomato and thyme jam, dunked in an almond milk and spring onion gazpacho. Bread dough that was proving on the table on arrival is cooked over the wood fire into roosterkoek. A candle with a story is lit in the centre of the table and the substantial bread course comes with cucumber and amasi, pig’s head terrine and asparagus; as the edible candle melts we dunk sourdough bread chunks into tasty beef tallow and onion. An unusual highlight is the salted lamb ribbetjies slow-cooked over the fire: crispy fat, tender meat on malted sorghum, with broad beans from the garden. Bokkoms have never before appealed to me, but Bertus considers them South Africa’s own umami treasure; served with fresh harder from the Abalobi fishermen, popcorn puree and viskopsop, it comes together beautifully. No-one needs to worry about going home hungry; if you manage to polish off the final meat course of succulent dry-aged sirloin, potato-topped beef pie and signature pumpkin tart, you’re hospitably offered more. We saved ourselves for the dessert sequence: a granadilla ice lolly palate cleanser, then a showstopping and decadently delicious peach confection. There’s an optional cheese trolley, and a garden of strawberry delights to accompany coffee. The Eike experience is three hours of superb fine dining, with its feet firmly planted on South African soil.